Come experience the casual elegance of an authentically handcrafted Caribbean resort. No tourist throngs. No jarring commercialism. Just an intimate getaway enclosed in a secluded cove. Surrounded by lush tropical forest, the Cove Beach offers rare natural beauty and unparalleled privacy. Float on azure waves, unwind in comfortable loungers, or sway in wicker chairs under a thatched pavilion. Our friendly wait staff will fill your food and drink orders from the Broken Rudder beach bar. With its twin stone piers, Christopher’s Beach is your launching pad for kayaking, snorkeling, and other off-shore adventures. Capping the piers, our iconic hand-thatched gazebos provide a panoramic vista for ocean gazing, sunset basking, and private dining. All this just a few steps from your private villa. Our certified water-sport instructors will supply everything you need for a private outing or a guided tour of our coral reefs. Snorkeling and kayaking are complimentary. Looking for a more intense offshore adventure? We can arrange a wide variety of excursions. Nearby Runaway Bay, for instance, has been called “one of the Caribbean’s best dive and snorkel spots.” First-timers and experienced divers can see dolphins, stingrays, sea turtles, and even sunken ships. Guests rave about our triple cascading pools. Designed by the owner and absolutely unique, the pools offer common areas for mingling and private nooks for sunbathing. Sip a cool drink and gaze out at the meeting of sea and sky. Most villas also have their own private pool. Set in walled gardens, our glistening dip pools are perfect for relaxing after a day of adventure or going for a midnight swim. 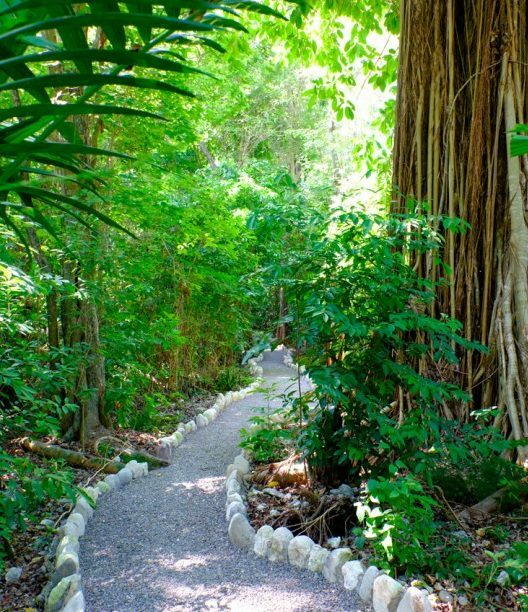 Two paths wind through twelve acres of pristine tropical forest. Experience the undisturbed habitat of exotic flowering plants, towering trees, and 20+ Jamaican bird species. Ten exercise stations, crafted from Jamaican mahogany, target different muscle groups for a full-body workout. Group classes and individual yoga sessions are available to relax your mind and restore your spirit. Our open-air facility sits above the cascading pools and gazes out at the surrounding cove. Perfect for exercise or meditation. Our outdoor spa overlooks the azure Caribbean from a rooftop pavilion. A menu of revitalizing treatments is available at your convenience, either in the pavilion or at your private villa. Hermosa Cove is conveniently located outside Ocho Rios, just minutes from many of Jamaica’s most popular destinations. Click on the Explore tab for a list of nearby attractions. Or give us a call. Our friendly staff is waiting to arrange your dream island getaway.